~ Greatly-reduced version of Nan’s “Reunion”. I didn’t say more about this painting in my previous journal entry because I wasn’t sure Jan or its maker would want to share images of it with a wider public. But I’ve checked with jan-u-wine who contacted the artist, Nanette-Rosie Gagnon (“Nan”), and they both are amenable to having the work showcased. Jan-u-wine first discussed with Nan the project of illustrating her poem, "Across So Wide a Sea", which tells of Sam’s reunion with Frodo on Tol Eressëa, at the "Hall of Fire", a festive fan-event which preceded the “Into the West” party for the 2004 Oscars. She and Nan had met on the LotR-based Decipher board. 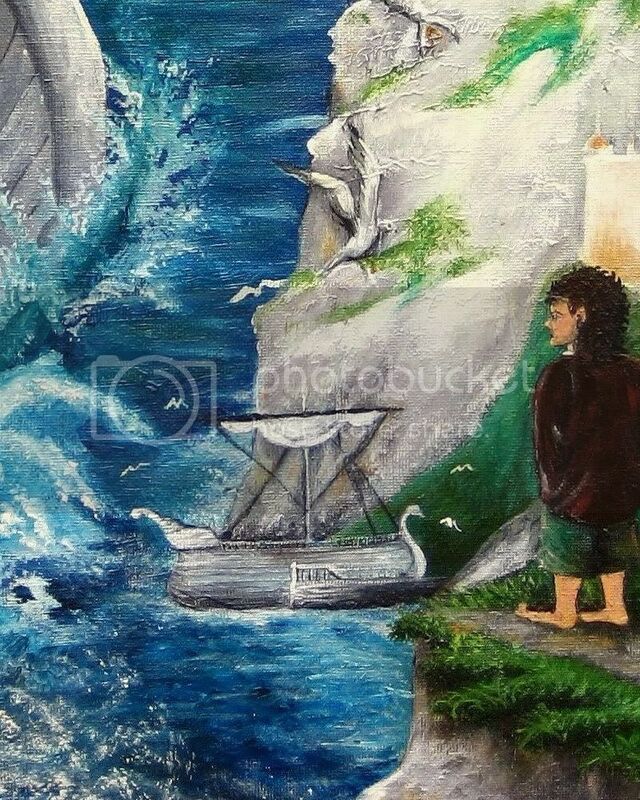 At that event, Jan read the poem aloud with another fan-artist friend, Debbie (who has created LotR fan art under the name of 'Primmy', some of which has illustrated Jan's poems, of which she also is a fan). Jan took the part of Sam, while Debbie read Frodo's sections. For the painting, Jan imagined a two-panelled piece that would depict multiple scenes from her poem, but in one visual sweep. Jan had seen this convention used in folk paintings. I am familiar with its use in religious art of centuries past, in which the artist attempts to tell a sequenced story in one picture. I have a copy of an early Renaissance painting, for instance, which shows God creating the world on the left, Adam and Eve being expelled from the garden by an angel on the right, with the various waters flowing out of Eden at the bottom. For her painting, other than specifying that the piece be done in a folk style, Jan felt that Nan should feel free to create her own look for the setting and figures. Once the viewer takes in the whole two-canvas painting, which Nan has called Reunion, the composition invites the viewer to examine it more closely, moving from left to right. The scenes correspond with the narrative in Jan’s poem, Across So Wide A Sea (posted after the images below). Entering from the left, Sam on the Elven ship sails a frothy sea. Behind a scrim of swirling grey mist, Middle-earth is visible, providing a tiny view of the world Sam has left behind. One can just make out the Grey Havens and one White Tower; even Mt. Doom is pictured, although it is no more. 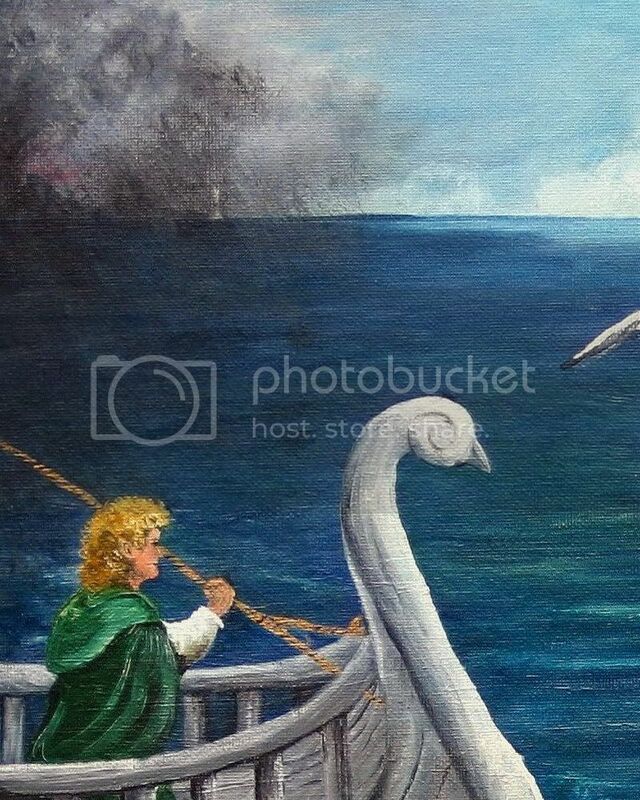 Following Sam’s eye to the right, Eärendil burns like a beacon in the evening sky over Elvenhome, guiding the ship. 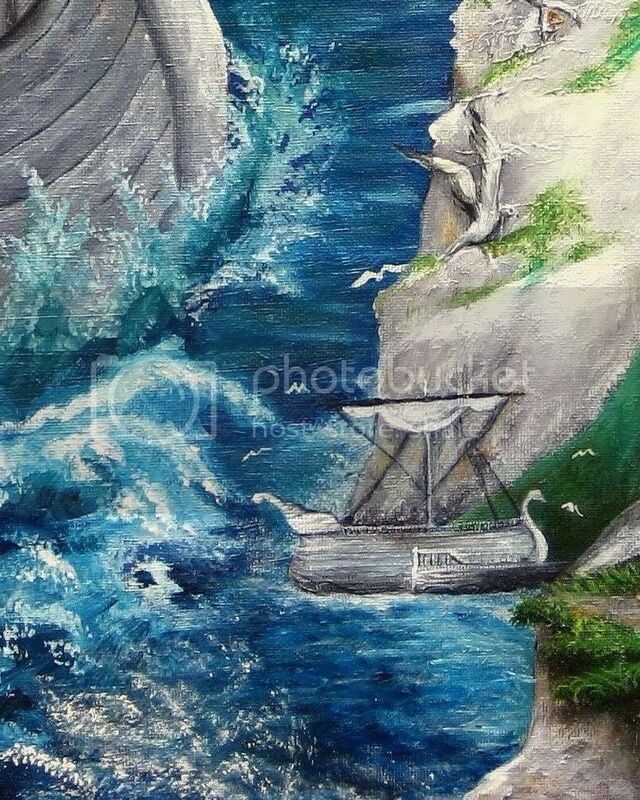 The eye follows the slope of the rugged, wind-swept land back down to the large gull with wings outspred, dropping down to smaller and still smaller gulls that wheel around Sam’s ship, now tiny, anchored in the mostly unseen firth. High above, standing upon the headlands, the solitary figure of Frodo stands and watches. 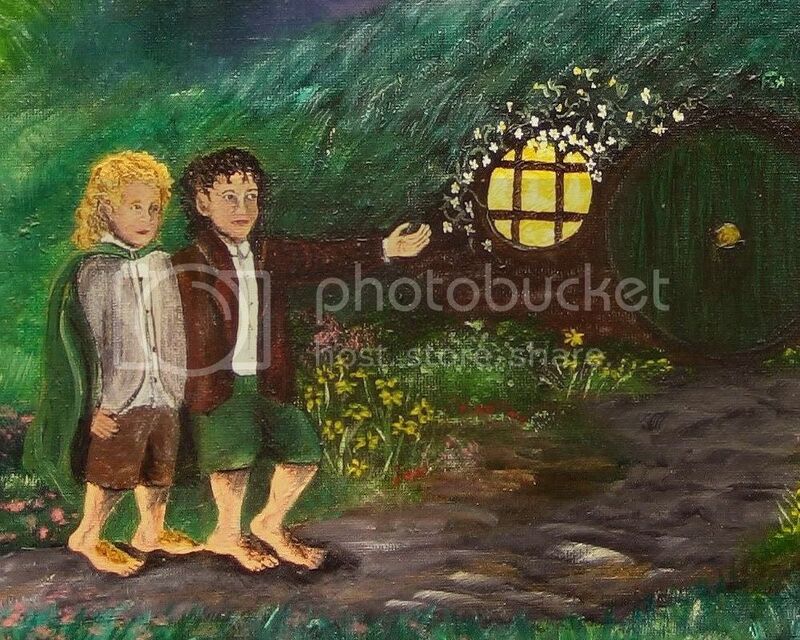 Then, without a blink, the eye is led to the right panel where Frodo is walking Sam up the path, now flower-edged, to the door of his new home, Bag End West. On the trellis around the entry, Jan pointed out, in honour of Sam's first child, Elanor (the Fair), Frodo has trained elanor to climb, the flower for which she was named. 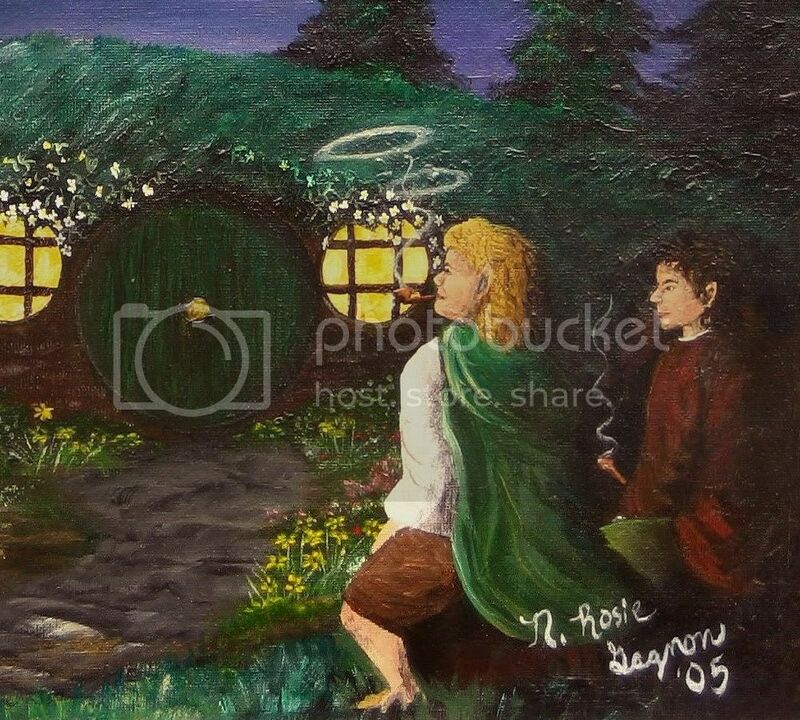 Finally, the viewer’s eye rests with Sam and Frodo as they sit smoking their pipes beneath a star-sprinkled sky, the twilight deepening into night. 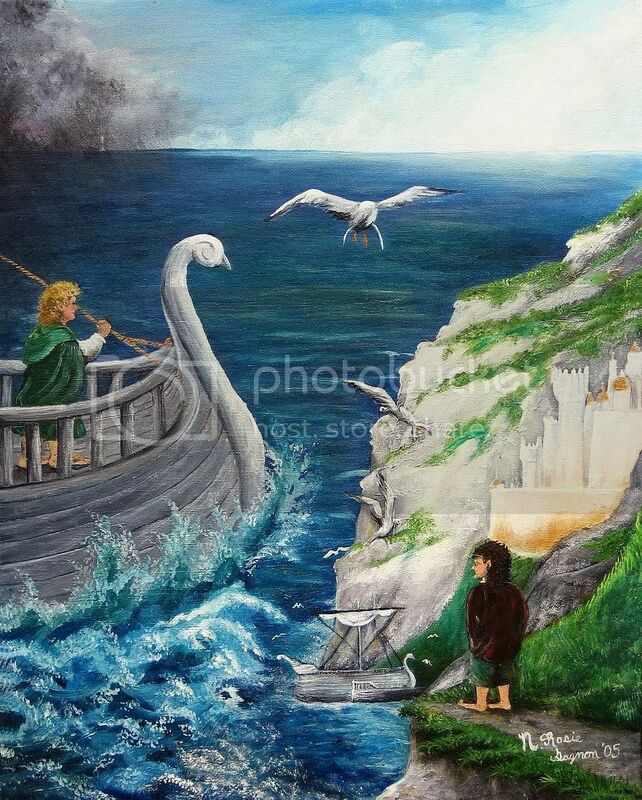 For me, this is a Tolkien-inspired painting of great charm, with an ingenious composition. My sorrow is that the panels are too large to present properly on a computer monitor. My husband took some nice pictures of them, which are better than what Jan had before, but a 16” wide monitor simply can’t show what there is to see in a 32 X 20 canvas. This painting’s power to enchant is in its detail as much as its overall design. I have provided a number of life-size views below, so that the details in the painting might be better seen, but they do not begin to show the crispness of the brushwork, or the array of colours Nan used. I tweaked and twiddled with my digital copies, Nan's originals propped beside the computer monitor for reference, but I could not get the colours to truly match. I got the general palette, but not the the variety of hues and tones. But these copies will have to do. 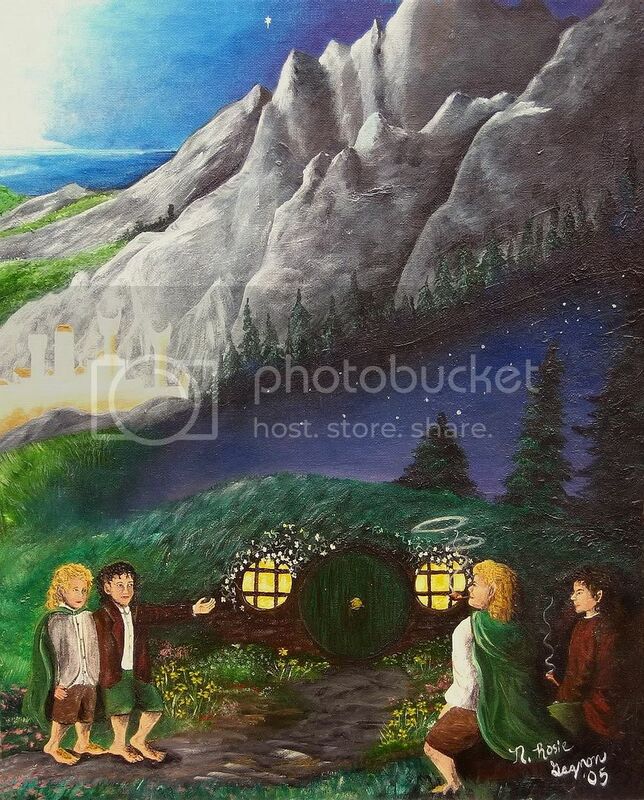 Here is a link to Nanette-Rosie Gagnon’s other Tolkien-inspired works, but if the difference between seeing Jan’s “Reunion” in person and in a little computer image is anything to go by, the tiny images on her web page could not do them justice. Note: jan-u-wine has received the honour of one of her poems, A Day of Rain, being selected for the November Amon Hen, a publication of the Tolkien Society. This is a real magazine, not an on-line journal. Amon Hen includes a wide range of material from the humorous to the scholarly, from announcements and reviews to fiction, artwork and letters of comment. It also frequently includes an extensive roundup of other small press publications, and an updated stock list from Tolkien Society Trading roughly every quarter, with news of forthcoming publications. Any member of the Society is welcome and encouraged to contribute. I love Jan's poems, as readers of this journal know. I read them more as beautifully reflective fics than as standard verse. Across So Wide a Sea moves me as deeply as her any of her very best. How she kept from weeping while reading it in front of a gathering of Tolkien fans I'll never know. The poem is posted below the images. It is September the twenty-second, 1482. I know now that I have never been whole. stop a little above my head. "I am glad you are with me…..
the brow of the Sea. *from Old English: "there and back"
After Jan received the panels, she thought them so lovely that she felt she must put Sam's feelings at seeing his new home down…. brings Home close to my heart. I was so happy when Jan told me she was going to get to visit with you on her trip to her auntie's home, recently. I didn't know she brought along the lovely panels that Nan painted, though! But Jan is thoughtful; it doesn't surprise me that she'd go out of her way to share something with a friend. Jan thought I might want to add some comment about helping her read her poem at "Tolkien_Forever's" Hall of Fire party back in '04. All I can think of to say is that I am always honored when Jan asks me to particpate in a reading; I love her poetry. When I read it I believe that (if such a thing is possible) Jan is channelling Frodo's and Sam's souls, and I get to visit with them for a little. Regarding my part in the reading, I am pleased to say that I delivered my portion without choking up, which can happen easily when speaking this beautifully poignant piece. I hope the emotion and meaning came through in spite of my decidedly un-Tolkienish southern accent. In conclusion, it never ceases to amaze me how Tolkien's works continue to inspire so many beautiful stories, poems, and art by his fans; their creations then interweave and inspire each other. Its a living, growing thing, Tolkien fandom, and so beautiful. I have been tearful many times, in the past months, over the beauty of Jan-u-wine’s Across So Wide a Sea. It never fails to sting (it hurts in a good way) when I read about Elanor and Frodo-lad saying farewell to their father. I can’t begin to imagine what it would be like waiting sixty years to be reunited with a beloved friend. I’m very pleased, that Nanette-Rosie Gagnon agreed to having her superb painting ‘Reunion’ showcased together with Jan's poem. I have been enjoying it immensely. It is so full of beautiful detail, bright and happy colours and, of course, it illustrates two of the most beloved characters in literature. Thank you for the close-ups, it’s a real treat to be able to see the brush-strokes. 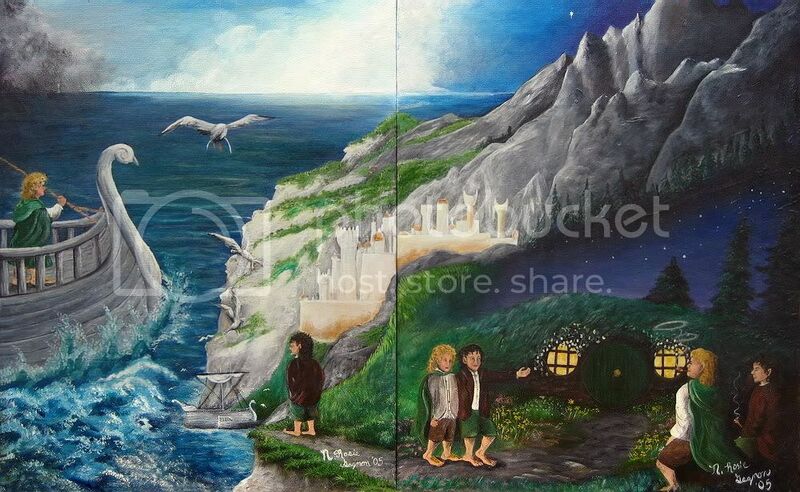 There is so much that can be read in this painting, so much that relates to the joys and sorrows in Frodo and Sam’s lives. Thanks so much for stopping by to look and comment, Este. I was hoping we'd get some good shots of the diptych and we did. I just wanted to do them justice. Thank you very much for this lovely post, Mechtild. I too have seen those kinds of early Rennaissance (and Medieval, I believe, as well) paintings that tell a story with the same people repeating within the work. The Bayeux Tapestry also comes to mind. The painting is utterly beautiful. I love how she has used that storytelling technique. That, for me, was the most quietly emotional bit. It is so visual that I feel as if I were there, with the history and memories of Bag End and all who lived or visited there: Bilbo, Gandalf, the dwarves, Frodo, and Sam. Unspoken words indeed! Lovely! I feel as if I were there, with the history and memories of Bag End and all who lived or visited there: Bilbo, Gandalf, the dwarves, Frodo, and Sam. Unspoken words indeed! Lovely! Oh, now you're making me cry over that part, too! Thank you for making that even more vivid for me. You are very right about the resonance of that line. Medieval art did this, too? I suppose it would have, since they also had so many paintings in which actual captions were included, lettered ribbons coming out of the mouths of subjects the way text balloons would today, in comic books or graphic novels. wow how beautiful! I love the paintings and love the incredible poems! Thank you for commenting, Periantari! I think Jan handled this inevitable split in Sam's feelings so well -- his sorrow over Rosie's death, his sorrow at parting with the children he so loved, yet sensing that he would not have realised what he was meant to realise in his life (his destiny?). Would he have fulfilled his life and his own personal quest if he *didn't* sail before he died, and wind up his life in the real presence of the world he'd loved from childhood, the world of the Elves and all the Elves stood for? And in the real presence of the other whom he had loved, the one with whom he'd endured so much -- both sublime and unspeakable? I get goosebumps and shivers each time I read Jan-u-wine's poem. Each and every time. Thank you so much for sharing this painting, and for including that poem. Aaah! Finally I had the time to sit down and read jan's poem and to have a thorough look at Nan's lovely two-panel painting! Thank you so much for presenting both pieces in one entry, Mechtild - it is just fantastic to have the pictures and the words together, every one of them a seperate work of art, but creating a sonorous chord while reading and looking. Jan's poem left me deeply moved (*sniffs discreetly in her handkerchief*), and Nan's painting is lovely - yes, I too am reminded of religious paintings in folk-style, like Ex-votos (votive paintings) in chapels and churches, or of renditions of Saints' lives with several events displayed in one sweep); I love all the details and the fresh colours and how the eye of the beholder is allowed to wander over it and discover more and more things. Really lovely! Thanks, Whiteling. Yes, it is neat the way the paintings contain so much. You can look at the whole thing, one panel at a viewing, or enter in and wander about as you say. Jan said it reminded her of comics or graphic novels in the way the image is meant to be "read" in a sequence of smaller images. But comics and such usually have dividers between the sequences. This one has the sequences in one image, like the old votive paintings. It is only in two panels because Jan had planned to mount them on the doors to an old cabinet of hers she loves. I don't know if she's going to end up doing that, though. Oh yeah.. I meant to add... The part about Bilbo's grave almost killed me. A beautiful painting. A beautiful poem. Both artists have excelled themselves. I'm so glad you enlarged the picture so that more detail can be seen. 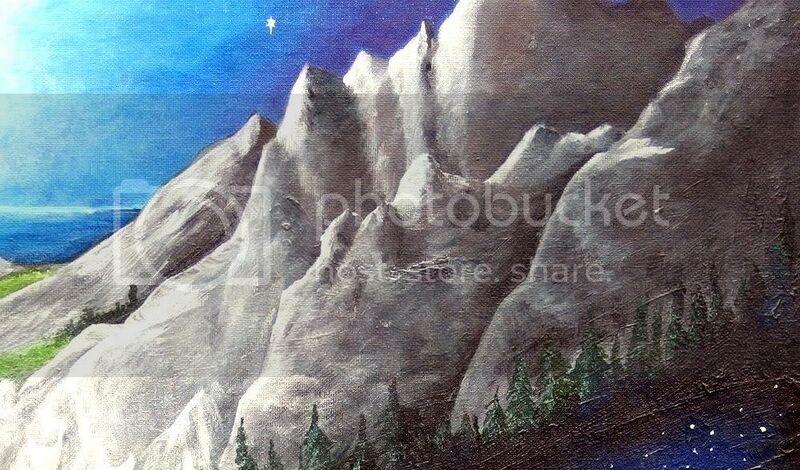 A great deal of love has been put into Nan's painting. I can almost hear the splashing of the water as the little ship cuts through the sea; the cries of the gulls hovering overhead; the homeliness of the garden and smial, and the peacefulness of two old friends sitting together in intimate silence. Excellent. I'll be honest in saying that poetry has never been my forte. However, Jan-u-wine has the knack of telling a story that goes straight to the heart. She paints her picture with words. It's a masterpiece. Thank you for bringing both of these works of art to us all. Thanks so much for commenting, Maewyn. I appreciate it. The picture is full of charms for the Tolkien fan, isn't it? So many details and vignettes to wander through, yet the overall composition works, too. It's like a story in pictures, all with in one picture. Maybe like one of the boxes that has smaller and smaller boxes inside, each with its own picture, but all of them fitting within the one. I can't imagine attempting anything so complex. I'll be honest in saying that poetry has never been my forte. However, Jan-u-wine has the knack of telling a story that goes straight to the heart. Exactly so. I tended to skip over poetry entries, too, although Este in the Harem thread helped me to appreciate poetry far more, bringing in examples of beautiful love poems from past ages so that even I had to say, "Wow, that was excellently done, true and beautiful." But Jan's poems -- for me -- read more like very intimate and highly concentrated fics, from deeply within the hearts and psyches and thought processes of their subjects. They tell stories the way that fics do, but from the inside of them, rather than from the outside. She really uses the medium of poetry to make her characters and Tolkien's world come alive in an intense and unique way. What a post! It left me slightly exhausted at the end ... and so it should be. The poem, oh my, the poem is gorgeous, sad, heartbreaking yet full of hope. The pictures are amazing, I am sitting here for a long time just staring at the prints I made. I love the details, the colors ... it's a picture who talks to me. This post is like a pearl for me, I'm so glad and grateful. Thank you, my friend, thanks to the wonderful artists. Reading the comments friends left ... it's all said. I'm very touched deep in my heart and in my soul Frodo and Sam will be forever! I love this poem - one of the best of hers I've read! What a sweet, dear love they have. Home indeed. The art is sweet also. I'm so glad you discovered this, Antane. Isn't it a splendid piece of writing?